There are many tall tales about what hot dogs are made of, but the Department of Islamic Development Malaysia (JAKIM) is eager to make one thing clear to food consumers: there are no dogs in hot dogs. 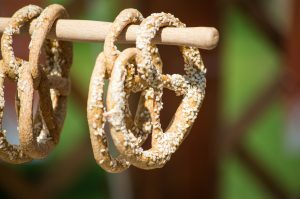 Last year, the Halal Division of the Department recommended that the U.S fast food chain, Auntie Anne’s, remove the word “dog” from “pretzel dog” in their menu. The director of the Halal division suggested that the frankfurter wrapped in a pretzel be called “pretzel sausage” instead, due to the Islamic proscription relating to dogs. Auntie Anne’s has since complied with JAKIM’s recommendations, despite comments from the public that the move is an overreaction by the local religious authorities. With this move by JAKIM, businesses looking to enter the Malaysian market may wish to be more sensitive to the use of marks that may seem offensive towards local religion or culture. This is particularly so if businesses are seeking halal certification for their business and are filing trade marks in the relevant classes for food and beverage products. In this regard, Section 14(1)(b) of the Malaysian Trade Marks Act 1976 states that “A mark or part of a mark shall not be registered as a trademark if it contains or comprises any scandalous or offensive matter or would otherwise not be entitled to protection by any court of law”. It is suggested that a trade mark examiner’s determination of whether a mark is offensive often involves an element of subjectivity, including in terms of the examiner’s personal views and perception of public opinion. Following JAKIM’s episode with Auntie Anne’s, it remains to be seen whether the Malaysian Trade Marks Office may adopt a similar train of thought when reviewing the registrability of food and beverage-related marks under Section 14(1)(b). Besides Auntie Anne’s, other food outlets selling hot dogs face similar challenges. For instance, A&W, which obtained halal certification in Malaysia, later renamed their signature Coney Dogs to Chicken or Beef Coneys, and their famous root beer to simply RB on their menu. Going forward, in the general interest of avoiding similar issues faced by Auntie Anne’s and A&W which may potentially include trade mark registrability issues as well, it would be prudent for trade mark owners to exercise circumspection and be receptive to any sensitivities that may be associated with the use and/or registration of their marks in Malaysia.